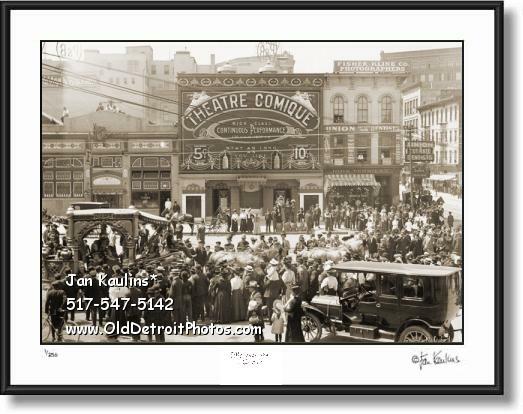 OLD DETROIT THEATRE COMIQUE photo print picture photograph for sale. This sepia toned photo of Detroit Movie and Vaudeville Theatre Comique was made from the restored old original rare vintage almost 100 year old (ca. 1920's) black and white old Detroit Theater Comique photo. THEATRE COMIQUE was located in downtown Detroit at 1249-1251 Broadway. It was one of the very early Pre-talkie theaters and Nickelodeons in Detroit. It was opened in 1921 and closed in 1928. You can see the very eye catching front of this large theatre advertising 5 cent seats in the balcony and 10 cent seats in the orchestra. This is a fabulous very detailed old vintage Detroit Theatre Comique photo print for sale showing this fabulous early Detroit Theatre on Broadway as a Circus Parade passes past the throng of spectators---the well dressed men with their derby hats and suites and the women with their billowy blouses and floor length skirts watch as the exotic cart from 'India' passes them by. On the side of the Comique are cigar stores, restaurants and bars in the thriving turn of the century downtown Detroit shown in this very unique and rare old black and white Detroit historic photo print.